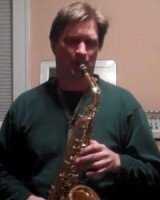 Dave Melstrand has been a private music teacher for more than twenty years. He has taught students from ages four to sixty-eight on saxophone, clarinet, guitar and beginning piano. His students perform well at the state solo and ensemble competitions, have won concerto competitions, and also placed second in the country at National Honors Band. Many of his students have pursued musical study at college and even attended the Paris Conservatory of Music. Dave received his music degree from the University of Wisconsin Milwaukee where he studied classical and jazz under Professors Jack Snavely and Curt Hanrahan. He then pursued further jazz studies at the Wisconsin Conservatory of Music under Berkely Fudge and Don Linke, and also privately with Curt Hanrahan. Dave’s performance experience consists of various small jazz combos, salsa bands such as Bajo Zero and Isla Adentro and also some big band experience. His focus in the lessons is based mainly on developing a strong foundational understanding of musical skill where the students learn to develop for themselves important practice habits requiring dedication, perseverance, concentration and memory. His advanced students are encouraged to develop their own musical voice through improvisation and composition.